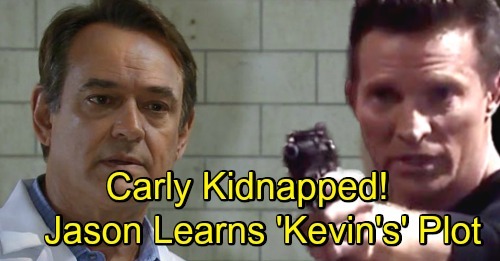 General Hospital Spoilers: Evil Ryan Kidnaps Carly, Determined to Protect His Plot – Jason Discovers ‘Kevin’s’ Secret? General Hospital (GH) spoilers tease that Carly (Laura Wright) will be busy watching out for Sonny (Maurice Benard) and her kids in the coming weeks. Sonny’s dealing with Mike’s (Max Gail) rapid decline, so Carly will want to help him cope. Of course, Michael (Chad Duell) will deal with more sorrow as well. He’ll have a hard time moving on after what he believes is Jonah’s death. Josslyn (Eden McCoy) is also having a bit of a teen crisis these days. She may take another walk on the wild side and leave her mom with a mess to clean up. However, Carly will be glad to pitch in. She’s just thrilled that she’s out of Ferncliff and off all those unnecessary drugs. Carly will concentrate on the people she loves most, but maybe she should start looking out for herself! It seems that’s how Jason (Steve Burton) will feel about the situation. General Hospital spoilers say Jason will develop some fears regarding Carly soon. On August 23, those fears will grow stronger. What will Jason be afraid of? It’s possible he’ll worry that Carly’s taking on too much. She went through quite an ordeal at Ferncliff, so Jason may feel like she needs to take a break and stop playing the hero. Then again, we should consider a far worse option. Carly knows more than she thinks she does, so she could find herself in real peril eventually. During a chat with Kevin (Jon Lindstrom), Carly admitted that she thought she saw him at Ferncliff. GH later revealed the mystery patient, which confirmed the apparent twin swap. It looks like Ryan (Jon Lindstrom) is pretending to be his brother while Kevin’s stuck in a strait jacket. Ryan clearly has an evil agenda, so he won’t want Carly blowing this for him. He’s probably pleased that she’s no longer a close threat at Ferncliff, but she could be just as risky in he outside world. No one would believe Carly in the looney bin, but they just might in Port Charles. Plus, Jason will believe Carly no matter what. If “Kevin” starts exhibiting any other suspicious behavior, Carly may be perplexed. She could fill Jason in and tip him off to trouble. Jason got fired from his janitor job thanks to the doc, so he may put the puzzle pieces together and realize something isn’t right. He’ll certainly have suspicions if Carly disappears! Could Jason grow more concerned when he doesn’t hear from her? Will Ryan kidnap Carly in hopes of keeping a lid on what she knows? If Carly’s hazy memory clears up, that could be an option. Ryan will inevitably do whatever it takes to preserve his plot. On August 23, Kevin will have a lot on his mind. That’ll be the same day Jason worries about Carly, so there could be a connection. Will Jason discover “Kevin’s” secret? General Hospital spoilers say this storyline will bring some fun twists, so don’t miss all the action ahead. We’ll give you updates as other GH news comes in. Stay tuned to the ABC soap and don’t forget to check CDL often for the latest General Hospital spoilers, updates and news. General Hospital Spoilers: The Person to Blame for Drew’s Childhood Suffering Finally Revealed: Was It Jim or Franco?